Andy Macfarlane and Murray Judge were the two main driving forces in the 1995 onwards development of Twin Streams area . Andy had the vision to imagine the routes that could be created in the giant crackles slabs to the left of his line, and the drive to realize them – bolting long routes in the mountains is bloody hard work, even with a pwer drill, and not many visionaries have the stomach for iit or the wllingness to pay for all theglue and stainless stel as well, while sacrificing good climbing time. Murray’s incredible new routing drive, undimmed over thirty years, remained the main impetus in Twin Stream development, especially now that he had got hold of some real grunt. To quote Andy: ‘The best thing to happen to NZ rockclimbing was Murray getting a petrol drill.’ The petrol drill may have made modern Twin Stream possible, but here’s a warning – don’t expect mindless clip –upps; you’ll need a comprehensive natural pro rack and the ability to use it for all but a few of the routes here. 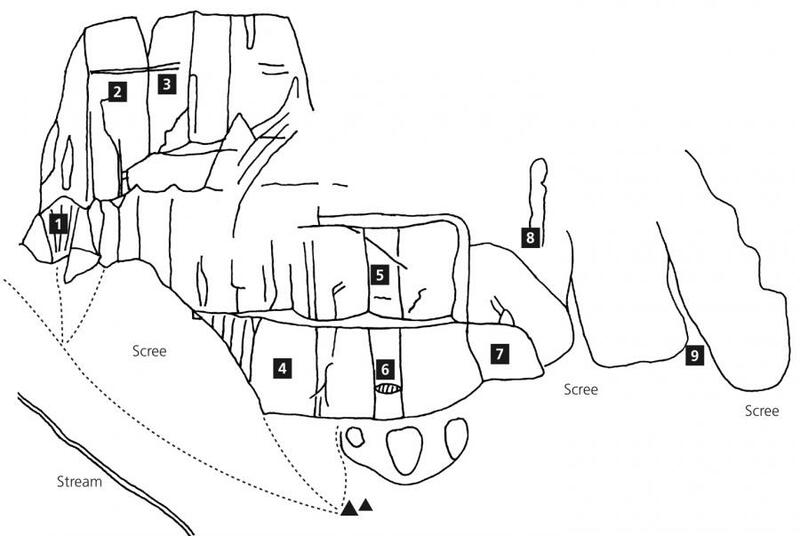 Dave Brash, New Zealand Alpine Journal, 2001. Two or three average rock bivvies exist under the litter of boulders below the Central Buttress. Three bivvies were formerly used, one at the top of the grassy flat and two under isolated boulders in the scree-field below Southerly Front. Both have water nearby. For larger groups it is worth taking tents, but the upper valley has little protection from a good norwester. Keas have become quite a problem in the last couple of years and will attack gear left out during the day and at night, so cover camp gear well with rocks and put tents away while you are off climbing. Litter is becoming a problem in the camping area. Please do not leave stashes of gear or food in the valley. Carry out what you have brought in. With increasingnumbers of people climbing at the crags, humans are making a significant impact on this small alpine area. There are no toilet facilities at present in the valley. Carrying out your own waste is appropriate behaviour. Climbers can purchase and use special purpose bags to carry out their waste and dispose of the bags into toilet facilities. Twin Stream in the Ben Ohau Range crosses the Twizel to Mount Cook road just before the Glentanner Station and airport, permission to cross the Glentanner Station land should be obtained from Ross Ivey Ph 03 435 1843. The best way in is by helicopter from Glentanner Park Helicopter Line, Ph 03 435 1855 or 0800 650 651. In 2002, up to five people could fly in for $185. The walk in takes 2 1/2 to 3 hours and starts on the true R, follow the river bed from the bridge for 500m past the first hill and climb up to a farm track. Cross the side stream and climb the clearest spur, which is cairned, to the upper terrace moving 5m right at the top and up a shallow gully to where an old bulldozer track leads around the edge of the terrace. Where this ends continue along the terrace edge to a dry stream at the midway shingle flats. Either follow the true R of the upper gorge or hop the stream to find the easiest travel to the upper basin. The Central Buttress is directly above the grassy landing site and camp-site, Southerly Front Slab is out of sight further up the scree slopes to the left. Shindig Gully is visible from the tombstone like boulder across the stream. Going up the spur to the terrace involved a bit of matagouri bashing. Going up/down the river is fine and seems faster. Awesome slab climbing! Helicopter was $248 (up to 5 people) + $25 per person DoC concession fee in March 2015. 2x50m ropes work well, and many of the abseils need abseil tat.